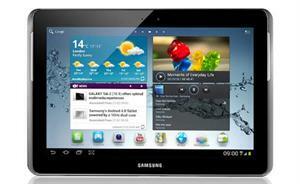 Read this review of Samsung Galaxy Note 10.1 tablet and also find specifications, price of this Android Tablet. Samsung is one of the best companies that can be considered as a topper in the gadget industry globally. And this achivement is not possible by only producing a single category of products, and there stands the mighty Samsung , who produce a number of products including mobilephones, TVs, Laptops, other accessories etc. And they have done their best in reaching such a high situation. Now the great Samsung comes with the new Samsung Galaxy Note 10.1, which is going to make that achivement that they have now to a more higher level. The year 2012, being considered as the year of many super gadgets, this will surely be a leading one of them. And this is made possible by introducing many super cool features that every one wants in their gadget. And the main thing, the new Samsung Galaxy Note 10.1 comes with the new Andriod v4.0, Ice Cream Sandwich and it has a lot more things that will surely attract the people's mind. Read more on this article to see what are those features that make it differ from its precessos and this tablet's complete specifications. 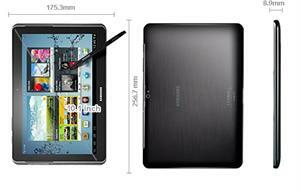 The new Samsung Galaxy Note 10.1 tablet is an high-end tablet while considering the 'inside' of the device. This doesn't mean that its is not good on the other features, but comapring to the other top products now available, this tablet is really awsome. And also while comparing to the previous version Galaxy Note, this new one has good updates for sure. And the main and to be noted feature is that it hits the market with the Google's new Android OS, v4.0 which is Ice Cream Sandwich. And this will surely attract more users because of the fluidic perfomance of the device and attractive UI. 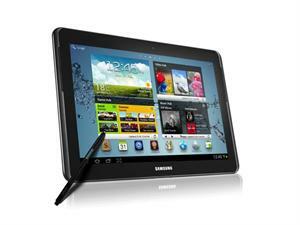 The new Samsung Galaxy Note 10.1 is powered by Quad-core, ARM Cortex-A9 processor, which is clocked to 1.4 GHz. And it runs on the latest and one of the best, Exynos 4412 chipset. The device also features GPU, which is one of the high-end, Mali-400MP, which will ensure the gaming and entertainment experience of the user to be perfect and attractive. The device is expected to be loaded with solid memory, 2GB of RAM, as per the latest information, is sufficient to make the device lightning fast and will give more fluidic and responsive perfomance to the whole device. With all this cool features and specs, we can assure that the new Samsung Galaxy Note 10.1 will be a sure competitor for other tablets offering good perfomance and this will surely beat that all. From the first look itself, it comes clear that the new Samsung Galaxy Note 10.1 itself is a samrtly designed device, offering maximum comfort to the users. And in making this to reality, the Samsung team has shown their excellence. 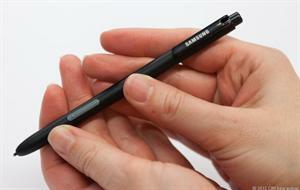 Actually that tablet is compacted that the device is much thicker as a normal pen. And with the Pebble Blue finish, the device becomes more elegant. On close examinig the device , we can see that, on the either sides, we can find two good quality stereo speakers. All the other physical options are made it on the top and bottom of the device. On the top, there is a line of different keys and ports. From the first,there is a power key, volume rocker, on the third position, next to the volume rocker, there is microSD port and next for HSPA connectivity. And there is connectivity options on the bottom of the device too. The display features of the new Samsung Galaxy Note 10.1 tablet is not so bad. The device has a fairly good screen size which measures 10.1 inches. And this large screen size offers maximum entertainment to the user while watching medias and other stuffs. Also the screen is of PLS TFT capacitive touch screen. The device offers a maximum resolution of 800x1280 pixels which is good for a 10.1 inch tablet. The display settings is further enhanced by providing 16 million colours and allocating ~149 ppi pixel density, which will enable the user to enjoy maximum colours, without lossing any clarity and quality. The capcitive touchscreen also supports multitouch, which is not a serious thing to be said because this feature is now a usual thing in all the tablets. And above these all, Samsung has provided Super AMOLED screen technology, which ensures high-end display to the device, which shows more vivd reds and greens without lossing a bit. And this can be considered as the main highlight of the Display features. The Samsung has provided the high-end features to all of them that we saw upto this, and has shown no shortage in case of the connectivity.The Samsung Galaxy Note 10.1 comes with HSPA+ connectivity which makes it pretty much fast compared to oter tablets out there. The device also comes with Bluetooth connectivity, which is of v3.0 which makes it fast during remote data transfer. It is a Wi-Fi enabled device, which is 802.11 a/b/g/n and features Wi-Fi Direct, dual band, Wi-Fi hotspot. The Samsung Galaxy Note 10.1 has USB ports v2.0 which is petty fast. The Samsung has managed to provide the best of the connectivity features to the new Galaxy Note. On talking about the other features, next thing comes on the line is the camera. The Samsung Galaxy Note 10.1 is featured with dual shooters. One on the rear which is 3 megapixels and 2 MP on front. The one in the rear is enhanced by providing autofocus feature and it also has a single LED flash to capture images even in low light. It can caputre an image of maximum resolution 2048x1536 pixels. It can also caputre video in 1080p @30 fps. It has Geo-Tagging feature too. The Samsung Galaxy Note 10.1 is provided with a S-pen, with stylus input which offers some cool features that comes in handy while doing some tasks on the device. It comes with some dedicated apps like S-note, Adobe Photoshop touch, Adobe Ideas, Shape recognition etc. There comes some pre-installed games on it too. The device is provided with GPS support with A-GPS. It has a bunch of sensors like Accelerometer, Gyro sensors, Compass etc. It also supports mcroSD support, which can be extended upto 32GB. The Samsung Galaxy Note 10.1 comes in different varients according to the storage space it has. It comes in 3 classess such as 16GB, 32GB and 64GB. and this is made possible only for the people who wants to buy Samsung Galaxy Note 10.1 at a low price. The Samsung Galaxy Note 10.1 was announced in MWC, Barcelona,2012. And it is expected to be released in August 15th,2012, as per the information that we got till now. And in case of price the Samsung Galaxy Note 10.1 tablet is expected to have a price of about $550 for the 32 GB version, that is it will cost about Rs.30,300 INR in Indian markets. The Samsung Galaxy Note 10.1 is truly a wonderfull device that offers great features that no one can refuse and the work done in making such an elegant tablet that shows its excellence in all fields such as display, perfomance, storage, connectivity etc, is great. And this device will be the best option for a person who is looking for a tablet. We strongly advice that not to with the Samsung Glalyxy tab but stick with the Samsung Galaxy Note 10.1 because it comes woth S-pen and other cool capabilities and the perfect price to be noted. So the Samsung Galaxy Note 10.1 will be the flagship product from the Samsung in the year 2012 and it ther will be no doublt in that. But the final result can be only known after the release. Samsung Galaxy Note II review: Features and specifications. Android smart phones are great, you have everything you could want in entertainment and it fits in your palm. You can play music, stay connected, download, troll apps and chat. You can do it all but can you use your phone like a tablet? Surprise!! the Samsung Galaxy Note II is a smartphone and tablet hybrid. If you would like a review before you buy Samsung Galaxy Note II, this is what you are looking for: A closer look at the Samsung Galaxy Note II. A comparison and review of features and specifications of Samsung Galaxy note with Apple iPhone 4S. Read the article to find a detailed comparison between Micromax Canvas A116 HD and Samsung Galaxy Note 2. The new Micromax Canvas A116 HD and Samsung Galaxy Note 2 have their own benefits and drawbacks. This article will help you decide which smartphone best suits your needs.